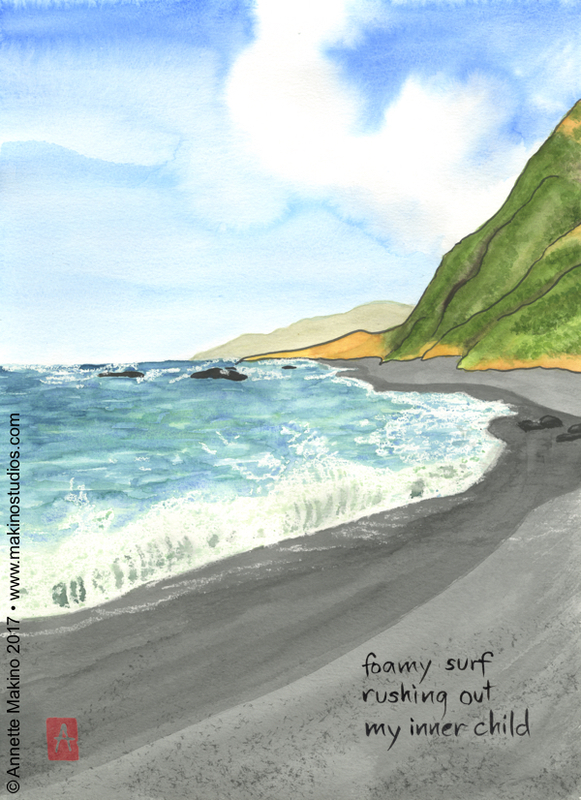 "foamy surf" is 11x14, painted with sumi ink and Japanese watercolors on paper. It depicts the Lost Coast in Humboldt County, California. Recently I spent a long, boring week in bed with the flu. When not sleeping, reading, or writing whiny haiku about being sick, I did some musing on the nature of time. There are so many ways that we fight with time. In the short term, like most modern-day humans, I often feel that there is not enough time in the day to do everything I want to do, like paint. So it was frustrating to be bedridden for days, with too much time on my hands but not enough energy to do anything with it! In the long term, as I get older, I feel a keener awareness of my limited time here on earth, and my finite window to contribute to the world. This, too, can lead to frustration that I am not accomplishing more. Time can also seem like an enemy because we only experience it flowing in one direction. As a result, it’s natural to compare the present with the concrete and specific past that we clearly remember rather than the misty, unknown future. And so we focus more on aging and loss: the slim waistline and the full, dark hair we once took for granted, the steel-trap memory grown rusty, the friends who have passed on. Why not focus instead on the fact that we are probably healthier, sharper, and more energetic today than we will be down the line? "celebrate" is 5x7, an image of cherry blossoms painted with sumi ink and watercolors on paper. What if, as in The Curious Case of Benjamin Button, we aged in reverse? Would we be more enthusiastic about growing “older” if it meant becoming more youthful? Yes, eventually there are diapers, mushy food and babbling at both ends of life. But for some reason this is adorable in toddlers, embarrassing in the old. Although none of us are evolved enough to transcend time permanently (is that what death is? ), we have all experienced the state of “flow” when we lose awareness of the passage of time. It might be while surfing, reading a great book, or playing music with friends. When I am painting—a right-brain activity—I’m focused on color and form, and the hours flow by uncounted. Paradoxically, perhaps we would feel we had “enough time” if we spent more of our days in this mode beyond time, when we are fully present and engaged in each moment. It shouldn't be that hard to do: as young children, we passed most of the day in this state, fully immersed in exploration and play. Zen graffiti on a water tank at Ma-le'l Dunes in Manila, California. 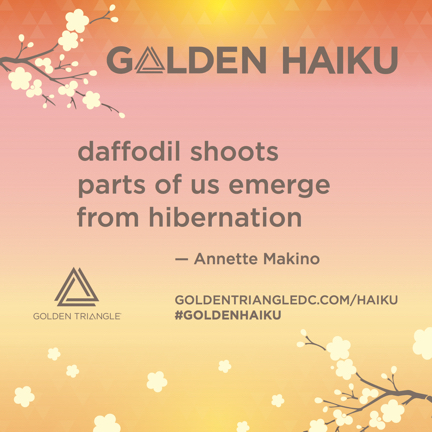 2018 Golden Haiku Competition: I’m delighted to share that the haiku below was selected to be featured on a sign in downtown Washington, DC this month! If any of my DC readers sees it, in the Golden Triangle neighborhood between the White House and Dupont Circle, please send me a photo! North Coast Open Studios: Mark your calendar for the 20th anniversary of this fun, free event, when more than a hundred Humboldt County artists open their studios to the public. I will once again join silk painter Tina Gleave and other artists at the Samoa Women’s Club in Samoa, CA for Weekend 1, June 2-3. More thoughts on aging: A 2013 blog post, “Younger than we’ll ever be,” uses prose, art, and haiku to explore the theme of coming to terms with getting older.